This is a Mama Buzz review. The product was provided by: PurpleTrail for this review. Need a great way to create, send and/or print cards and invitations online? Party planners and novice planners are enjoying the ease of PurpleTrail as the only provider of online, stylish, ad-free invitations and eCards for free. There are membership options available to customize for each own's needs and preferences starting at only $5. My review is a step by step process of creating my first online invitation post a very easy registration process that takes very little time and was not difficult. Options include "Print Invitations & Cards" or "Online Invitations & Cards." I chose "Online Invitations & Cards" and had over 69 pages of choices. You can click on and see the 69 pages of choices and sort through page by page or enter what you are looking through in the Search box for designs. If you place your mouse over the "Online Invitations & Cards" text, it will allow you to search that way as well. I chose the "Christmas" designs via the mouse hovering option and had to choose from an abundance of great designs that made it very hard to choose from! I was very easily able to choose options such as adding my own photo (or one from PurpleTrail), my text, embellishments and more. Once I uploaded my photo, I was able to choose the opacity level, other options such as black and white (there are more), crop the photo and add frames. I won't go through all the steps as the program is easy to follow when creating your cards and invitations. To print, PurpleTrail allows the user to sort by selecting the preferred formats: "Print Format" options by choosing Postcard 6x4, Postcard 4x6, Folded Card 8.5x5.5, Folded Card 5.5x8.5 or all sizes. For this review, I selected the Postcard, 4x6 option. The free membership provides two pages of choices. PurpleTrail also offers a nice how to tour here which I found as a must have. I needed a little more explanation on how to add things and remove them. The invitation box was what prompted me to take the tour. Fun and great looking invitations, e-cards and announcements. Thousands of designs to choose from or create your own unique design. Send invitations through email, SMS, Twitter and Facebook. Chat with your guests in real time, add a map to the event venue, pot-luck feature which helps each guest specify what they are getting for the party. Easily manage and track guest responses. Visit the party ideas section and blog with tons of great ideas for your party. 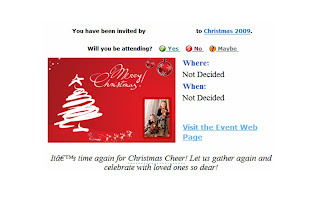 The invites are Ad free, so your guests/friends won’t have to see ads along with your invites/e-cards. Four different membership types with one being FREE. 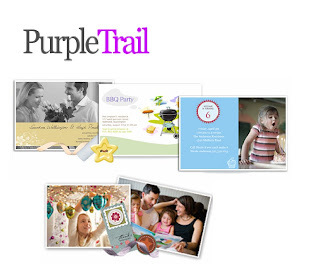 Overall, I enjoyed PurpleTrail and will continue to utilize it for my online cards and invitations. I am curious about the other membership levels and might take a peek to experiment on what I like the best. Free is good though and the quality of choices is excellent. This is a Mama Buzz review. The product was provided by PurpleTrail for this review.